Vintage Armagnac 1990 brandy wine (50cl). << Back 1990 Armagnac brandy wine (50cl). 1990 Armagnac brandy wine (50cl). Vintage Armagnac 1990 brandy wine Vaghi Baron de Sigognac (50cl). A rarity in itself, for an aged Bas Armagnac. If this is a special gift you can pick the delivery date after you checkout. 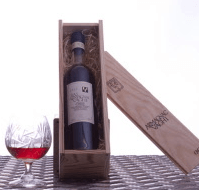 Vintage Armagnac 1990 brandy wine Vaghi (50cl). Armagnac is a result of the traditional distillation of white wine made of grapes from Gers and a few villages in South West of France. The name dates back to the gallo-roman times of Arminius. The first known distillation was in 1411 and first commercial activity involving Armagnac was registered in 1414 in France.